Shanti Stupa is a white-domed Buddhist stupa on a hilltop in Leh. The Stupa was built in 1991 by Japanese Buddhist Bhikshu who was the part of Peace Pagoda mission.There is a huge idol of Buddha placed inside the Stupa which was enshrined by the 14th Dalai Lama..The stupa has become a tourist attraction not only due to its religious significance but also due to its location which provides panoramic views of the surrounding landscape.The beauty of Shanti Stupa takes a level up at night, especially during the full moon night when it is naturally illuminated by the moonlight. Leh Palace is a former royal palace overlooking the Ladakhi Himalayan town of Leh. The palace was built by King Sengge Namgyal in the 16th century. Leh Palace is nine storeys high, the upper floors accommodated the royal family, while the lower floors held stables and store rooms.Leh Palace is an excellent example of medieval Tibetan architecture.The walls of the palace was constructed with wood and mud helps keep the scorching heat away, thus the palace has a soothing and pleasant temperature inside.The entrance of the palace is decorated with wood carved figurines. The roof top of the palace provides spectacular views of the mountain and the entire town which attracts the tourist from all around. You can enjoy shopping for curios and souvenirs in the bazaars and markets of Leh, while on your tour of Ladakh. Popular items with tourists are Pashmina shawls, stoles and other Pashmina wool garments. Locally handmade woolen socks, gloves, caps and sweaters are a favorite of tourists in Ladakh. Tibetan handicraft items including prayer wheels, Buddhist masks and Thangka paintings can be purchased in Ladakh. Tibetan silver jewelry and traditional Ladakhi jewelry with turquoise are also popular with tourists. Apricots that grow abundantly in Ladakh are another popular gift that you can take back as a delicious souvenir of your trip to Ladakh. Handwoven rugs, carpets and shawls are available in a range of prices in Ladakh's markets. The carpets have floral or geometric designs or dragon motifs on them and can also be hung as decorative wall hangings. Woven in wool gathered from Ladakhi goats, and dyed with natural dyes, Ladakhi carpets and rugs are thick, long-lasting and objects of utility and beauty, which you can buy while shopping in Ladakh. Some other popular items with tourists are Pashmina shawls, stoles and other woolen garments. Handmade woolen socks, gloves, caps and sweaters are also a favorite of tourists in this region. Then the market is also filled with carpets and handwoven rugs in a range of prices. During your visit, you must not forget to buy apricots, because this dry fruit of the region is considered to be of a good quality. Asia is a big hotel situated by the stream in the lush and green village of changspa. Although being in the heart of the city we are located in a peaceful place surrounded by nature. We are just five minutes walk away from the city centre. Once you are here our travel desk takes care of all your travel needs, from issuing inner line permits for the places that needs permits to visit to organising tours around leh. We are always happy to provide you with the best. All the rooms in all three blocks at Hotel Asia have spectacular view of the green surrounding and the beautiful snow covered mountains. We have a garden restaurant serving ladakhi, chinese, indian and continental cuisines. Our specials are healthy Ladakhi breakfast and dinner. Vegetables are picked from our own garden , so that every time you get fresh and healthy meals. Hotel Lumbini a popular hotel in Leh ensures pleasurable stay with unmatchable facilities and value added services. Everything that is needed to make a stay here memorable has been incorporated with utmost care. Hotel Lumbini is surely a leading hotel in Leh that offers an exclusive range of amenities and facilities to the travelers. All rooms are tastefully decorated and arranged. Needless to say, these rooms are dotted with a good amount of contemporary facilities.The ambience is so warm that guests feel like curling up in and drive away the tiredness. Hotel Fort View Leh Ladakh is situated in Leh. Leh Fort View Hotel unites your expectations of world class hospitality with our vision of Guest delight. Step in to a world of warmth and harmony, Step in to the world of Leh Fort View Hotel Ladakh! It has total 10 deluxe rooms with attached bathroom. The Hotel Grand Willow Leh is one of the Best Hotels in Leh for a memorable holiday. Our Hotel Grand Willow Ladakh was established in 1991. 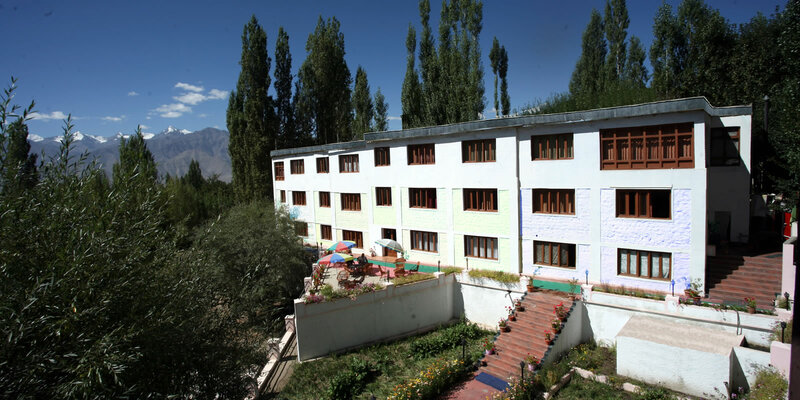 Our Grand Willow Leh Ladakh is situated in the heart of the Leh in a picturesque green garden area. 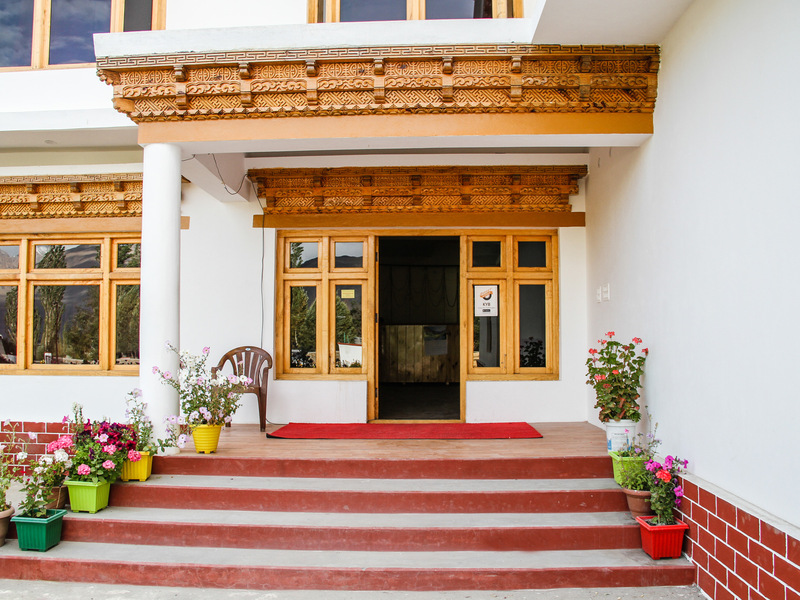 Our Hotel Grand Willow Leh Ladakh is located approximately 4 kilometers away from Leh Airport (Kushok Bakula Rimpochee Airport) so you can easily reach Grand Willow from Leh Airport. Our Grand Willow architecture and interior decor represents best of local traditions. The eye-catching architecture and interior design with Tibetan and local artifacts add to the beauty of Grand Willow. Our Grand Willow Hotel is also located at a walking distance from the Leh main market, so you can easily go for shopping. Our Grand Willow is a best holiday hotel with all luxury facilities and unforgettable hospitality. 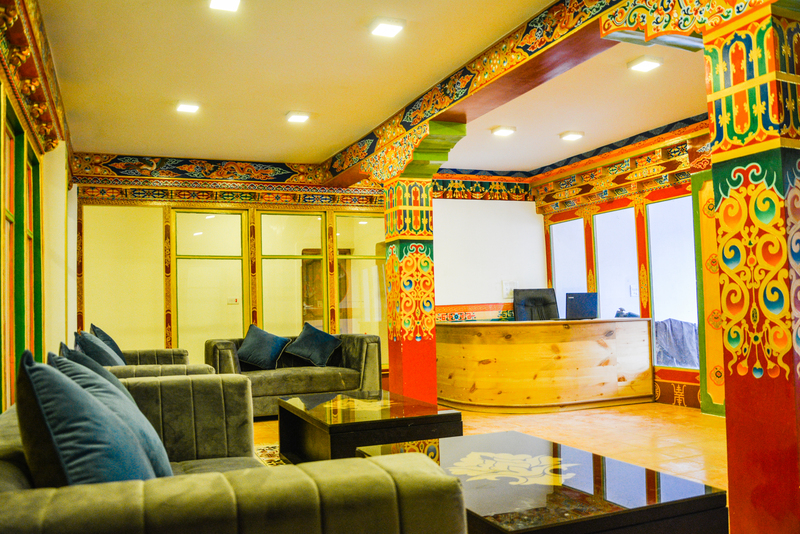 Located in Leh, Hotel Holiday Ladakh is connected to the airport and convenient to Leh Temple and Shanti Stupa. 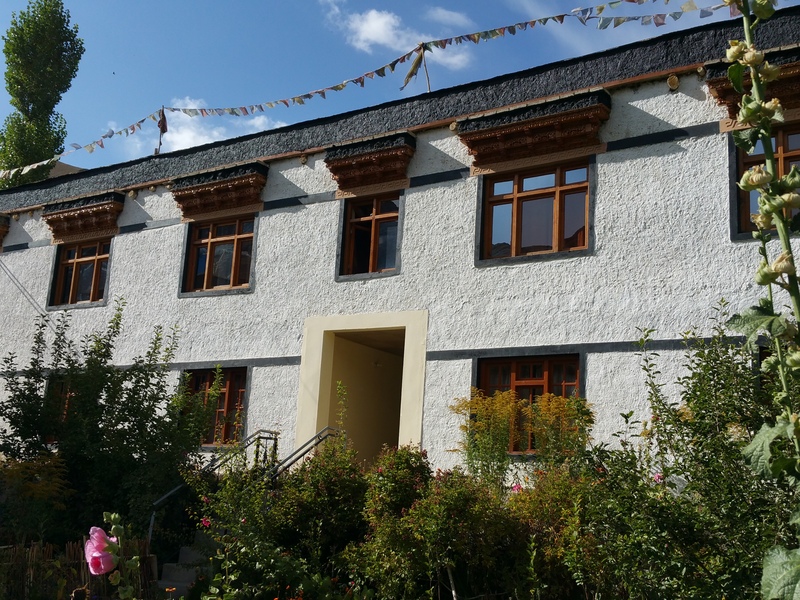 This hotel is within close proximity of Namgyal Tsemo Gompa and Sankar Gompa. Make yourself at home in one of the 22 guestrooms. Complimentary wireless Internet access is available to keep you connected. Private bathrooms with showers feature complimentary toiletries and slippers. Conveniences include phones, as well as desks and complimentary newspapers. 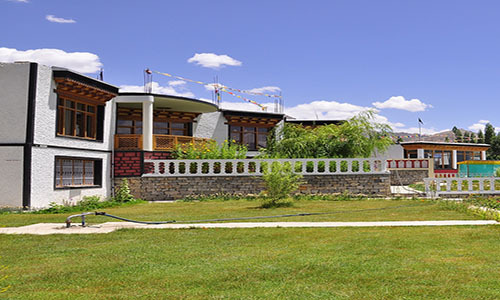 Eco Poplar Resort is a charming resort located at Shenam Fort Road, Leh Ladakh. The resort welcomes you to an opulent stay in its organic environment in the Himalayas. Our resort imbibes a compelling essence of nature with a lush green surrounding and tranquility to soothe your soul. 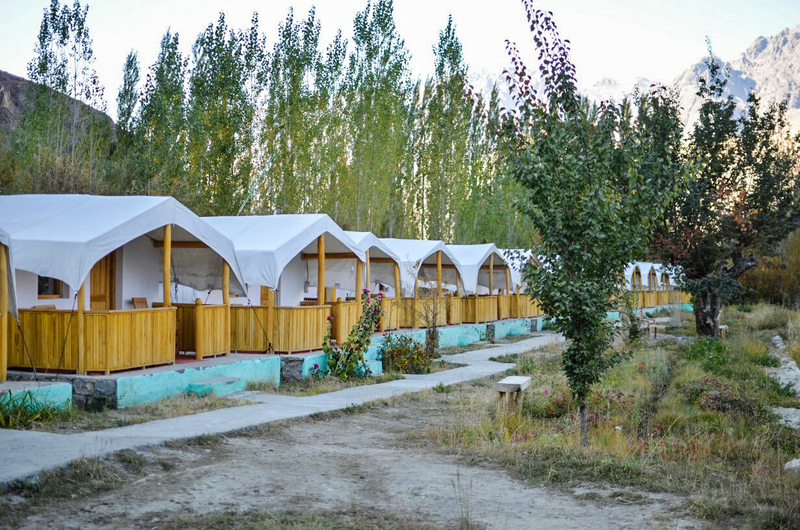 Based in Leh, which is one of the most captivating locations of the country, our resort offers you with a spacious territory among the groves of poplar trees. We have an in-house apple orchid which provides our customers with a pleasant organic retreat. At Eco Poplar Resort, Leh, customer satisfaction is our prime interest. The “Ladakh Retreat” WHERE YOU CAN FEEL THE TRUE ESSENCE OF LADAKH is a name that attracts travelers looking for a relaxing accommodation in Ladakh,we aim to create a happy and propitious atmosphere for guest.The interior designed on a Buddhist repertoire of symbol and motif that reflect the good fortune you will notice semblance in the design ,which is meant to provide reassurance in a unknown land . 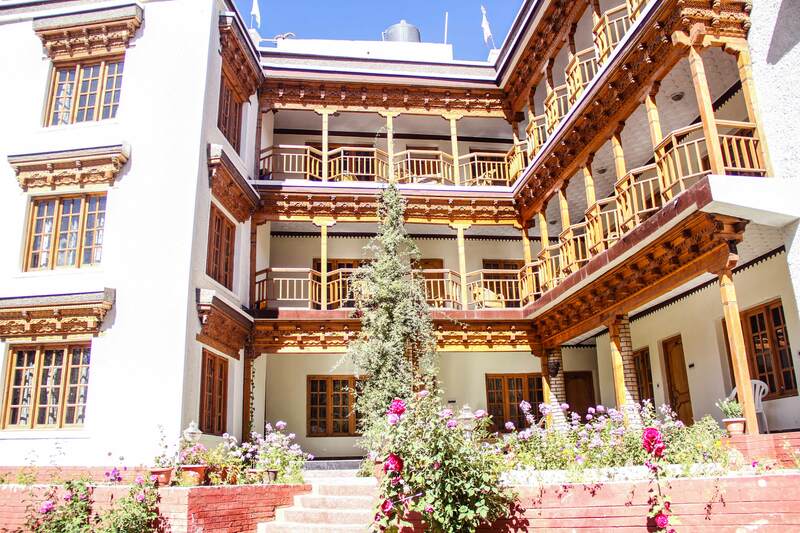 Located in the heart of the ancient town of Leh, The Hotel is designed traditionally, eco friendly and constructed on the lines of a Ladakhi Palace architectural built-up. Designed by famous ladakhi Interior designers it has unique & excellent Ladakhi architectural structures known as Shingtsag and all the rooms have been provided with Raphsal ( Balcony) as you find in the Palaces around Leh Ladakh . The Hotel has been ranked as Super Deluxe Plus,all the rooms are provided with world class modern amenities as per the norms required in a Super Deluxe plus Hotel with homely feel and unique ambience to suit your needs, taste and expectations. 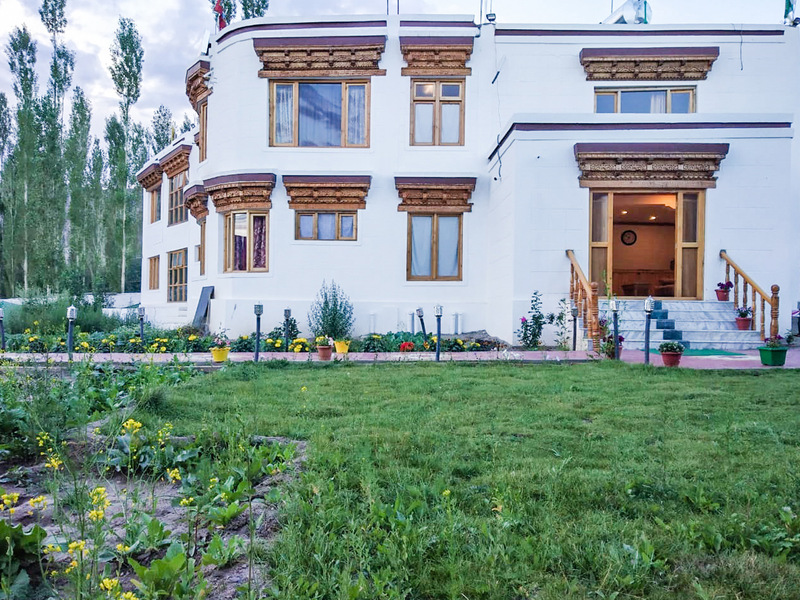 The Hotel is located near Shanti Stupa and Leh palace.You can further have a splendid view of Stok Kangri towards south, khardungla towards the north. Located in the thick of mountains and divine nature is our property, Lharisa Resort, Ladakh. Encompassed with the beauty of Ladakh, this resort is spectacularly jagged, with arid mountains enfolding this magical town. This picture-perfect resort crowns absolute beauty amid elegance and allurement. Providing an A-class stay, we pamper guests with the best of facilities and services. Avail niceties such as complimentary breakfast, free Wi-Fi, room service, adventurous activities, and much more. The resort is also in good proximity to transport hubs and tourist attractions. 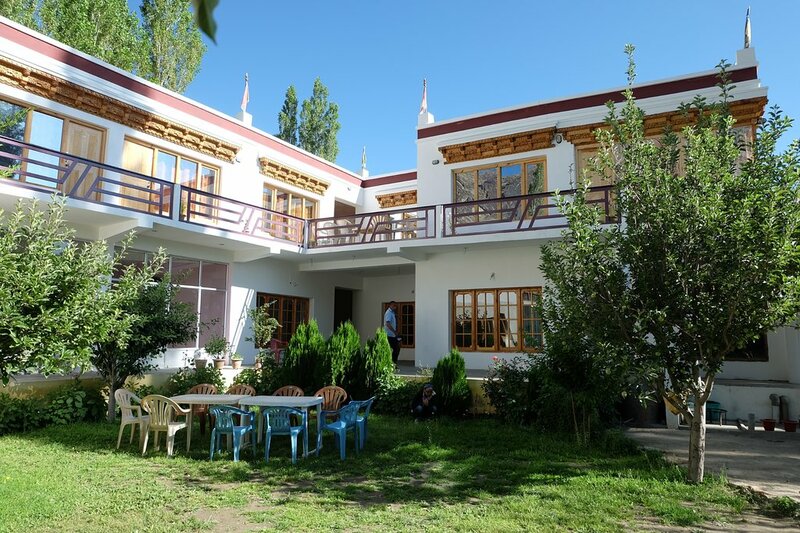 Ladakh Residency is perfectly located for both business and leisure guests in Leh. Both business travelers and tourists can enjoy the hotel's facilities and services. To be found at the hotel are 24-hour room service, Wi-Fi in public areas, car park, room service, airport transfer. Each guestroom is elegantly furnished and equipped with handy amenities. Entertain the hotel's recreational facilities, including garden. 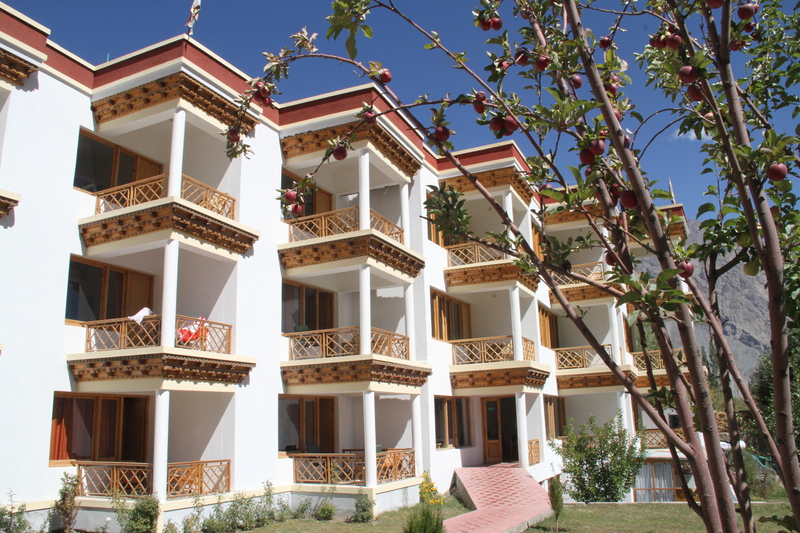 Convenience and comfort makes Ladakh Residency the perfect choice for your stay in Leh. The Druk Ladakh Hotel is a popular choice amongst travelers in Leh, whether exploring or just passing through. The hotel offers a high standard of service and amenities to suit the individual needs of all travelers. Free Wi-Fi in all rooms, 24-hour front desk, 24-hour room service, Wi-Fi in public areas, car park are there for guest's enjoyment. Each guestroom is elegantly furnished and equipped with handy amenities. Access to the hotel's garden will further enhance your satisfying stay. No matter what your reasons are for visiting Leh, The Druk Ladakh Hotel will make you feel instantly at home. Gurudwara Pathar Sahib sits on the Srinagar-Leh Road at some 25 km from Leh. Much revered by people of all faiths, it is dedicated to Guru Nanak. Going by the folklore, it was built to house an unmovable boulder. Back in the year 1970, this boulder was discovered during the road construction but could not be moved by any machine. As per the story, Guru Nanak appeared in the dreams of monks, the construction workers and the Army and asked them not to remove the boulder! Thus, a gurudwara was built to preserve the same. Almost all the vehicles on the stretch take a stop at the gurudwara to pay respect and pray for a safe journey on the rather treacherous roads. Magnetic Hill is a gravity hill located near Leh in Ladakh, India. The hill is alleged to have magnetic properties strong enough to pull cars uphill and force passing aircraft to increase their altitude in order to escape magnetic interference in reality, the effect is an optical illusion created by the gravity hill. The “magnetic hill” is located on the Leh-Kargil-Baltik national highway, about 30 km from Leh, at a height of 14,000 feet above sea level. On its eastern side, flows the Sindhu, which originates in Tibet and goes to Pakistan The hill is located on the Leh-Kargil-Batalik national highway, and is bordered by the Sindhu river. The Indian Army maintains a sikh Gurudwara near the hill where Guru Nanak Dev, the first of the Ten Gurus of Sikhism, meditated in the 15th century. Due to both the Gurudwara and the gravity hill, the area has become a popular sightseeing destination. Sangam Valley is a 48 kilometre drive from Leh and is the confluence of the rivers Indus and Zanskar. Just the view of Sangam Valley from the road above it can make you swoon in ecstasy. The colours of the two rivers can be distinctly seen at the confluence. It is an amazing place to sit, relax, and enjoy a picnic with family and friends. Lamayuru Monstery is a famous Buddhist Monatery in Leh district, at a height of 11520 ft.Lamayuru monastery is said to be the oldest as well as the largest in Ladakh.This Monastery was a collection of five gigantic building out of which only one survives now,still remains the largest monastery.The Monastery houses about 150 Buddhist monks permanently, in earlier days the number was 400.The Monatery is also famous for a worth visiting festival called the mask festival as the monks were different mask during the ceremony. Hall of Fame is a museum which was built in memory of the brave soldiers who lost their lives fighting for India at the Indo-Pakistan war.This museum is maintained by Indian Army.The Museum showcases seized arms and amenities of Pakistani Army, pictures and biographies of brave soldiers.It also displays Siachen area, exhibiting apparel and amenities used by the Indian Army in the region.Inside the museum, one can also witness items related to Ladakhi culture, history, vegetation and wildlife found across the globe. Hotel Duke Saspol is located in the heart of Sham Valley. 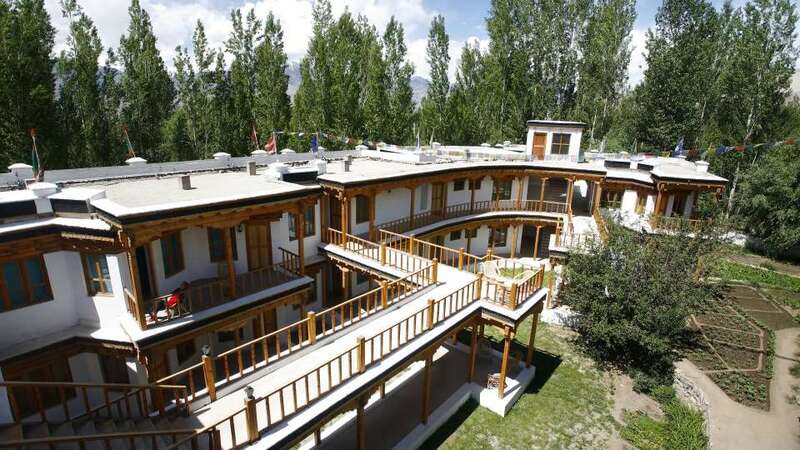 Hotel Duke Saspol Ladakh India is nestled within exquisitely landscaped grounds of Saspol Village. Hotel Duke Ladakh is situated on the Leh Srinagar Highway and only 55 kilometers away from the Kushok Bakula Rinpoche Airport. Our Hotel is the Best A Class Hotel in Saspol offering memorable Saspol accommodation for our valuable guests. Our Hotel Duke Saspol India houses 23 well furnished deluxe rooms with full range of facilities for our precious guests and you can also enjoy a panoramic view of divinely beautiful Himalayan range from our rooms. Our Hotel is surrounded by few of the most ancient Buddhist monasteries to visit, and you can enjoy an exhilarating combination of activities such as rafting, trekking and cycling for a memorable holiday. Faryork Resort Nurla is one of the Best Resorts in Nurla. Nurla is a breathtaking tourist place in Ladakh well known for its scenic location and peaceful atmosphere. Faryork Resort Alchi is located on the bank of beautiful Indus River offering lovely views of mountains and jungles. Our Faryork Resort Nurla Ladakh India is located between Leh and Lamayuru and only 2 hours drive from Leh. Faryork Resort India offers 13 spacious cottages with all basic amenities. Our Cottages are made of bamboo in order to give you more natural camp feel and best Nurla Accommodation along with the sound of water and wind. Our Faryork Resort Ladakh has lovely restaurant and houses Traditional Ladakhi Style Dining Hall where you can enjoy various Indian and Ladakhi dishes. Our Faryork Resort Nurla India is perfect place for nature lovers. Our Faryok Resort Alchi is among the Best Cottages in Nurla and Cottages in Alchi. Our resort is the only Resort in Ladakh where you can enjoy the experience of crossing the Indus River through a Wooden Bridge as there is an amazing wooden bridge crossing located at the other end of the Resort. Hotel Moonland Lamayuru makes the stay stress-free with various facilities, 26 hour room service, parking, travel desk and doctor- on- call are the basic amenities offered to the guests for convenience. The in-house restaurant serves delectable food which can be savoured during the stay. 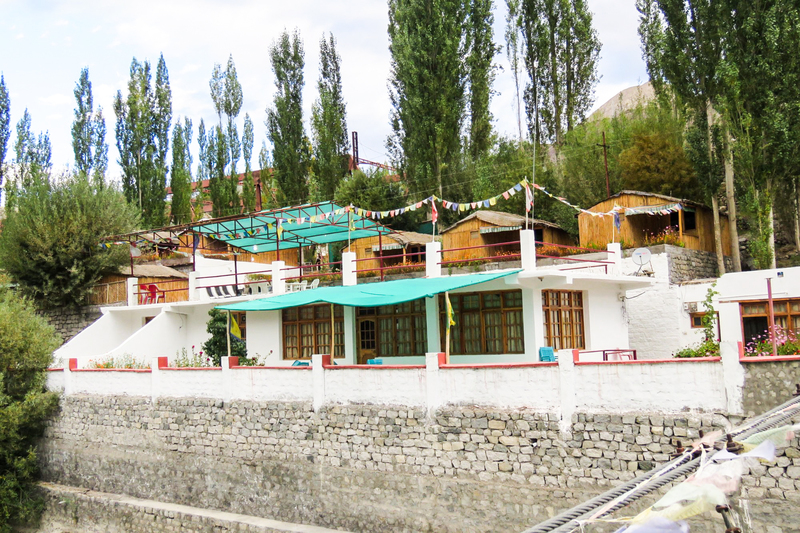 Hotel Moonland Lamayuru is situated at Leh-Srinagar raod, Leh-Ladakh. It lies proximate to Leh (Approx.120km) and Srinager (Approx. 300km) which can be explored during the stay. Hotel Moonland Lamayuru Being a Premium Budget Hotel in Lamayuru. We offers to you the simple gesture of genuine hospitality and high standard of services. At par with the quality and standard, Hotel Moonland Lamayuru has an aura of peace, friendliness and a home-like environment that you can immediately connect to. Guests can also explore places like Atisha Monastery & Wanla Monastery near by to Lamayuru. Uley Eco Resort is ideally located for visiting all of Lower (Western) Ladakh while staying in comfort. Uleytokpo, a tiny village 70 km west of Leh on Leh-Srinagar highway, has been in the service of tourism industry ever since Ladakh was opened for tourism in 1974. 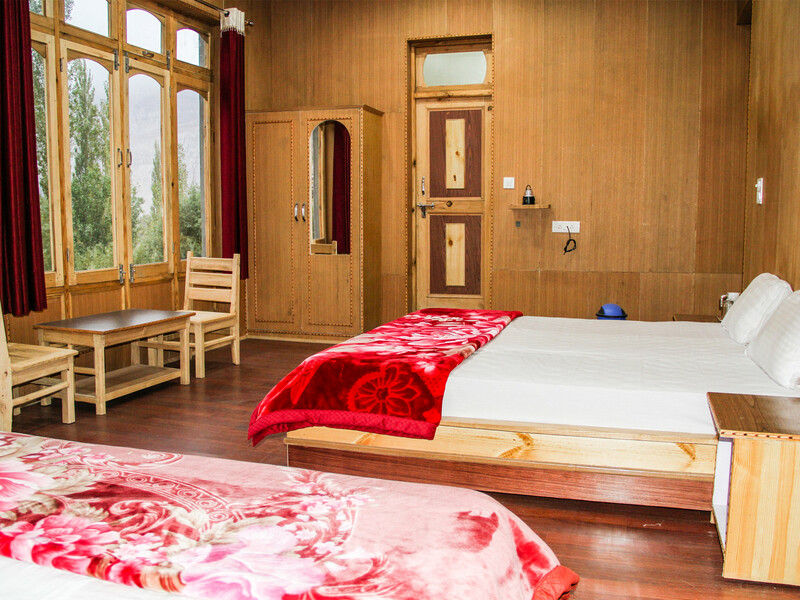 Today it has a more matured infrastructure with better choice and comfort as family-run Uley Eco Resort (total 26 rooms), one of the best resorts in the region promise a quiet, comfortable and ecological stay during your visit to the lower region of Ladakh. Free yourself from urban congestion in separate cottages sprawled over a large area among apple and apricot trees and the kitchen garden. Closeness to nature will relax your body and soul. The monastery was built for the Namgyal rulers in 1680, Bazgo itself was embedded in the early days of Ladakh and is frequently mentioned in the Ladakhi Chronicles when it was a political and cultural center. In the 15th century, a palace was built in Basgo. Alchi Monastery is situated in the bank of Indus River and shares a distance of 70 km from Leh.It is Considered as one of the oldest Buddhist learning centers in Northern India.Alchi is an ancient Monastery,constructed by Guru Rinchen Zangpo between 958 and 1055 AD.The elaborate artwork along with wood carving and the amazing huge ancient statues of Buddha attract the tourists from all around.Tourists across the globe explore this place just to enjoy the heavenly beauty and to experience the ancient architecture of the monastery temples. Khardung La is a mountain pass in the Ladakh region of Jammu and Kashmir.It lies north of Leh and is the gateway to the Shyok and Nubra valleys.The elevation of Khardung La is 17,582 ft.It is a famous attraction for adventure seekers.Biking at Khardung La Pass is something visitors shouldnot miss. It was opened to public motor vehicles in 1988 and has since seen many automobile, motorbike and mountain biking expeditions. The pass is historically important also as it lies on the major caravan route from Leh to Kashgar in Central Asia. The thrill of visiting the highest pass in the world will churn up your emotions. 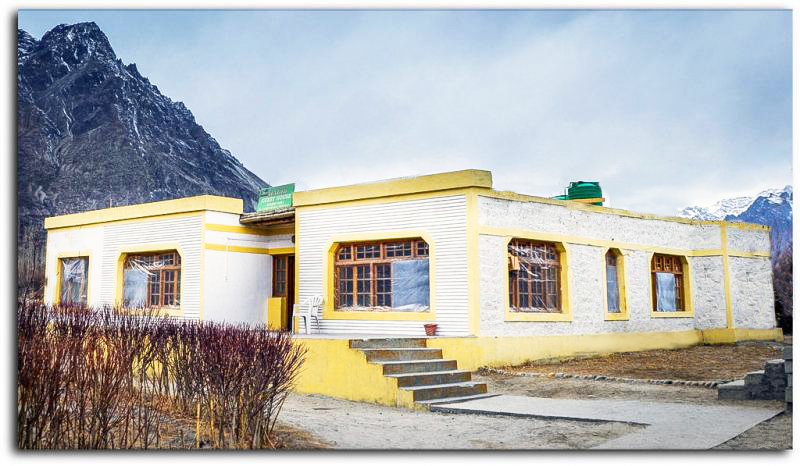 The Guest House is located in peaceful picturesque place in Hunder, Nubra Valley. The Galaxy Guest House Hunder is one of the perfect travel destinations for tourist to feel at home when in Nubra Valley. The Guest House and is surrounded by a lush garden and plenty of greenery. The Galaxy Guest House Nubra Valley has 12 comfortable rooms for memorable Nubra Valley accommodation. The guest house has amenities like Free Wi-Fi, LED TV with Satellite Channels, on-site restaurant offering mouthwatering homemade meals, etc. The Galaxy Guest House Nubra Ladakh is among the best Nubra Valley Guest House. You can easily reach Nubra Valley Sand Dunes which is one of the best places to see in Nubra Valley. 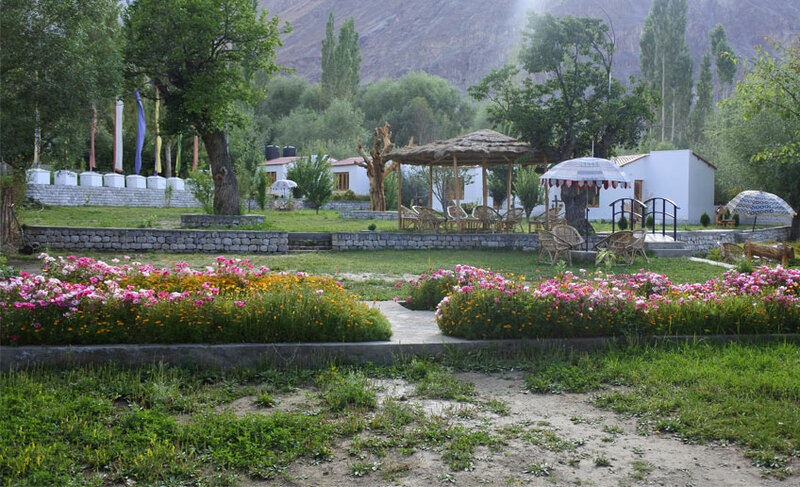 The Habib Guest House is located in the beautiful scenic place in Hunder, Nubra Valley. The Habib Guest House Nubra is one of the Best Guest Houses in Nubra Valley. 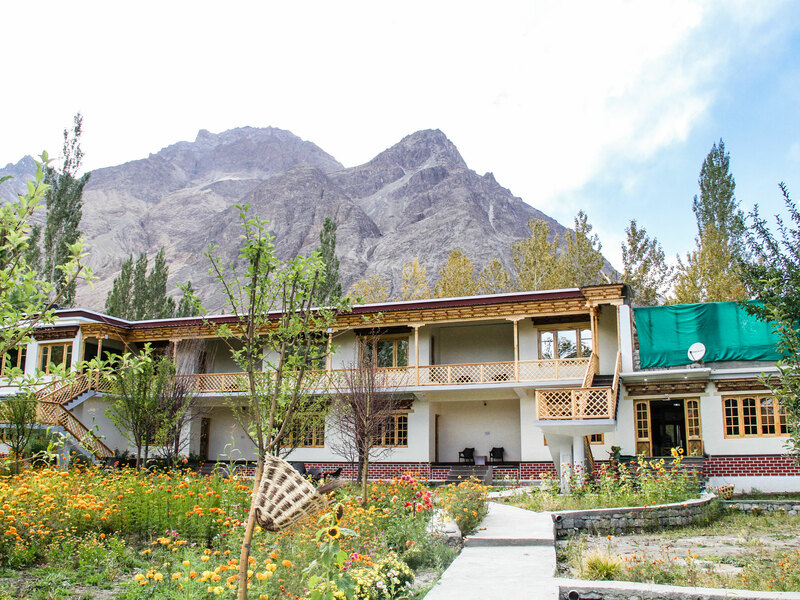 The Rahman family runs this Nubra Valley Habib Guest House. The Habib Guest House Hunder houses reasonably prized spacious and comfortable rooms with a large attached spotlessly clean bathroom. These rooms are well furnished with hot water geyser so that visitors can get adequate hot water in the morning when it is usually freezing cold outside. 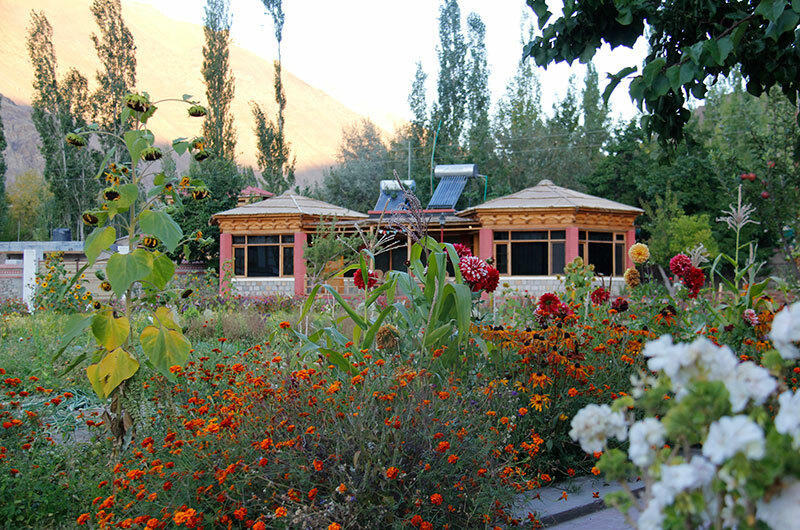 This guest house in Nubra Valley has organic garden, Apricot and Apple trees and also local sea buckthorn berry trees. We offer a memorable homely stay in Hunder, Nubra Valley. 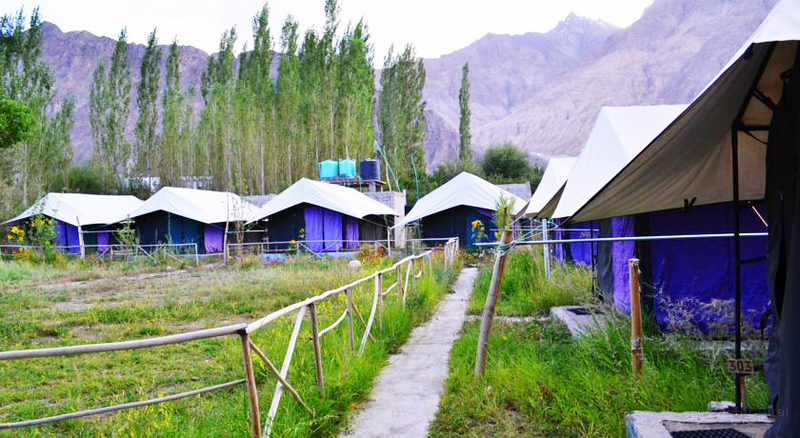 Dowa Deluxe Camp Nubra is B class camps in Nubra valley the only best accommodation in the Hunder Village Nubra, P.O. Diskit Nubra. The Dowa Deluxe Camp having 15 deluxe rooms with clean attached bathroom. These Camps Are furnished with attached western WC's, running water (hot water supplied on request), and prepared to provide guest ease at high altitude in windy and cold conditions. 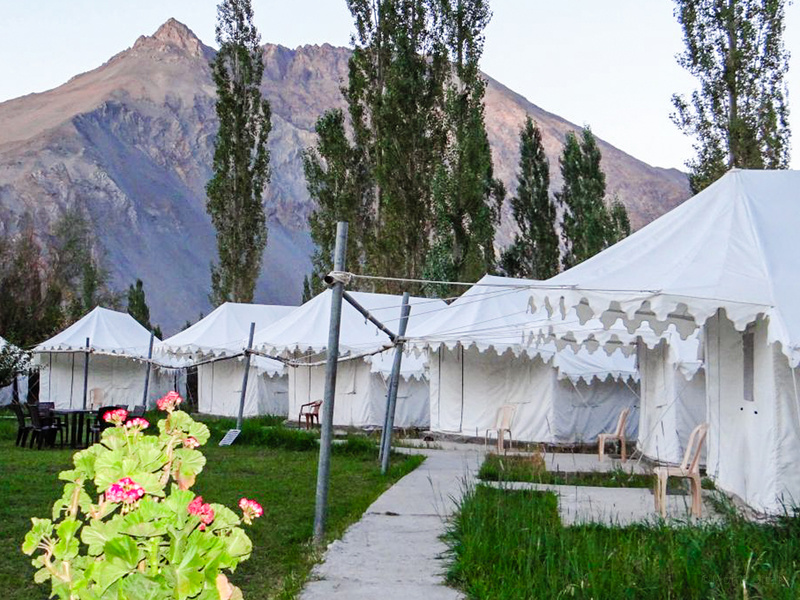 Paradise North Camp Nubra Valley is situated in middle of lush greenery Hunder Village Ladakh. Paradise North Camp Hunder is well located at a place, from where, the tourist can have the best amazing views of the surrounding environment, like-Karakorum Range of mountains, Shayok River, etc. Hotel Real Siachen Nubra is located in Diskit surrounded by breathtaking views of spectacular Nubra Valley. Hotel Real Siachen Nubra Valley is one of the best accommodation in Diskit.Hotel Real Siachen Nubra has 22 deluxe rooms. Hotel Real Siachen Nubra Provides all the necessary services like 24 hour room service, Campfire, Doctor on call, Hot and cold water, parking, free Wi-Fi and many more. The rooms are very luxurious, clean and well furnished. 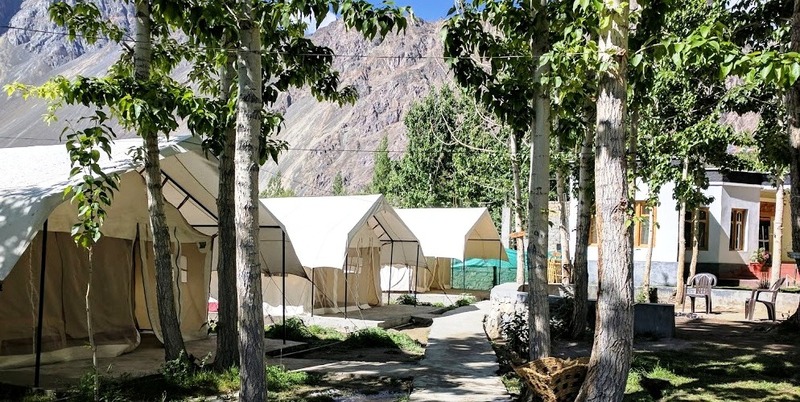 Shangri La Camp Nubra is A class camps in Nubra Valley and it is best accommodation in the Hunder Village because tents of Shangri La Camp Hunder are concrete. Shangri La Camp Nubra Valley have 14 deluxe concrete tent with attached bathroom. 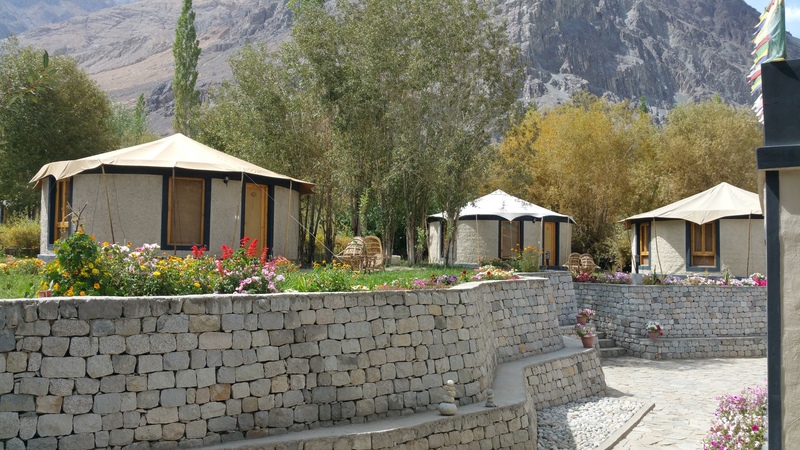 Shangri La Camp Nubra Ladakh is situated in the center of the hunder village where you can relax and enjoy the beautiful scenery of Nubra Valley. The Shangri La Camp Nubra Tariff can be affordable to you please have a look. 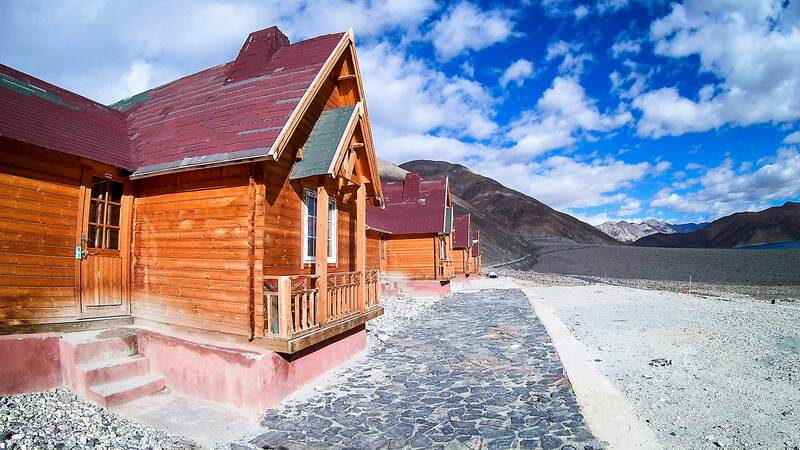 Apple Nubra Cottage comprises 20 Swiss tents with attached baths and heating equipments. There is a separate dining hall as well serving local food.Camp also organizes day trips and trekking to the nearby villages of Nubra to monasteries of Nubra.When it comes to unique holidaying at Nubra, Leh-Ladakh, staying in Swiss Tents is an option worth considering .This pet friendly holiday destination invites guests who want to get away from the hustle and bustle from city life to enjoy the most elusive commodity that they yearn for peace and tranquility. 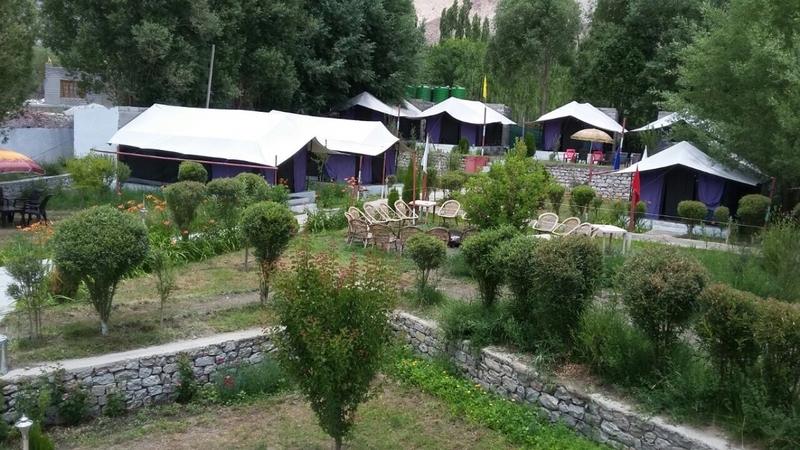 Set amidst the Shayok river area on one side and the Nubra valley.We provided with clean and comfortable rooms in a Apple Nubra Cottage.It Is On The Banks Of The Shayok River. The Hudner Eco Villa Nubra is situated in beautiful village of Hunder on the banks of Shyok River of Nubra Valley. The Hunder Eco Villa Nubra Valley Ladakh houses offers 11 deluxe rooms for comfortable accommodation in Nubra Valley which is provides facilities like cable/satellite TV service, Doctor on Call, 24 hr. front desk etc. Hotel Hunder Eco Villa is one of the best 3 star hotels in Nubra Valley. Naycho Resort Hunder Ladakh is one of the Best 3 Star Hotels in Nubra Valley. Naycho Resort equipped facilities like 24 hour running hot and cold water. Hunder Naycho Resort rooms available with spacious twin beds and double beded room. Our Naycho Resort houses well furnished rooms with basic facilities for guests and you can enjoy a view of eye-catching mountain from room. Himalayan Eco Resort and Camp is an eco-friendly resort comprising 20 private and independent luxury cottages and 05 deluxe tents, each affording a grand view of the snow-clad mountains, located amidst the vibrant woodlands and majestic plantations of poplar, willow, apple and apricot. A lifestyle that brings a smile to your lips with the sweet smell of greenery, invigorating fresh mountain air and chirping of the birds accompanying the glory of the resplendent sunrise. The colours and the fragrance of the beautiful flower beds, organic farm produce, children-friendly environment of the Resort offer a welcome change from the chaotic pace of cities. Mystique Meadows Earth Homes Nubra Valley is placed in the heart of Hunder village of Nubra Valley. Nubra Mystic Meadows Earth Homes have 13 mud brick cottages created and conceptualized using classical methods and new architecture. 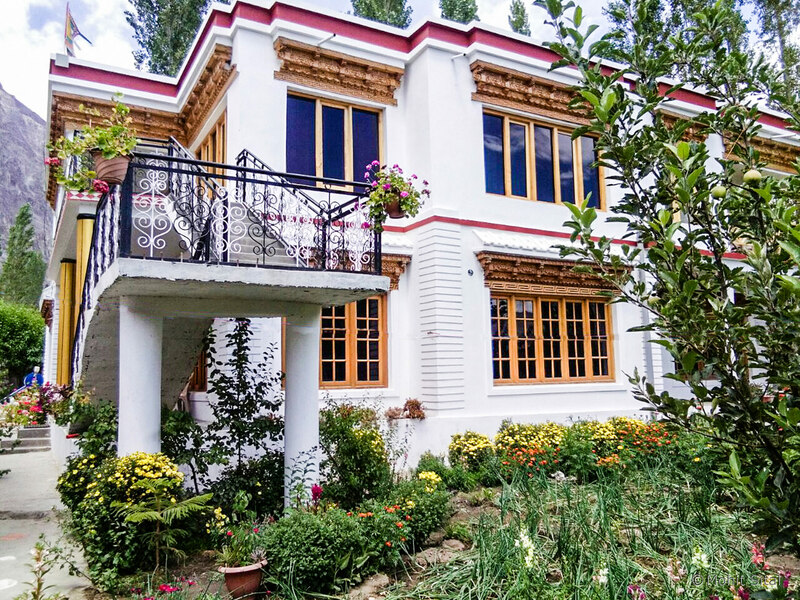 A affluent accommodation in the heart of Himalayas Symbolizing the civilized ambience and warmth of one of the most approved tourist destination in the country. Pangong Lake, is an endorheic lake in the Himalayas situated at a height of about 14,270 ft. The Lake is 134 km long and extends from India to China. Approximately 60 of the lake lies in China. The lake is 5 km wide at its broadest point. The lake freezes completely during winters, despite being saline water. The Lake has no fish or other aquatic life in the lake, except for some small crustaceans, but there are numerous ducks and gulls over and on the lake surface. There is a variety of birds including a number of migratory birds and a number of species of wildlife including the kiang and the Marmot. The Woodland Cottage is geographically located in the beautiful picturesque place in Pangong, near Pangong Lake. 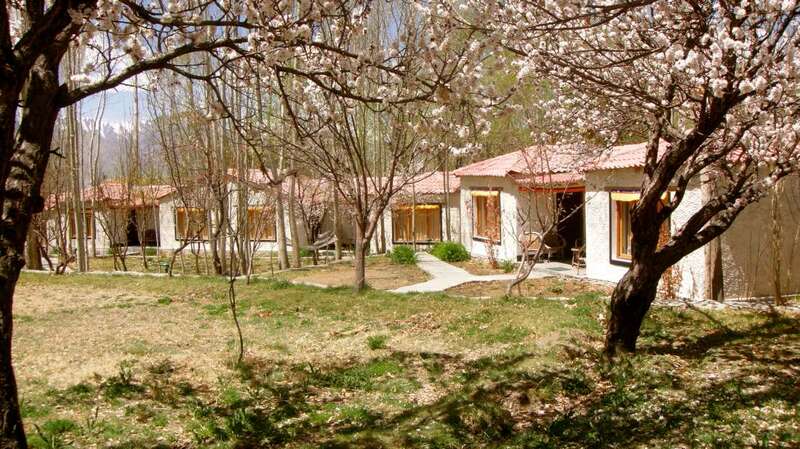 The Woodland Cottage Pangong is one of the Best Cottages in Pangong for delightful accommodation in Pangong. The Woodland Cottage Pangong houses decent prized spacious and cozy cottages with attached washroom. Pangong Woodland Cottages are well furnished and clean. This Pangong Woodland Cottage is situated just in front of the beautiful Pangong Lake. 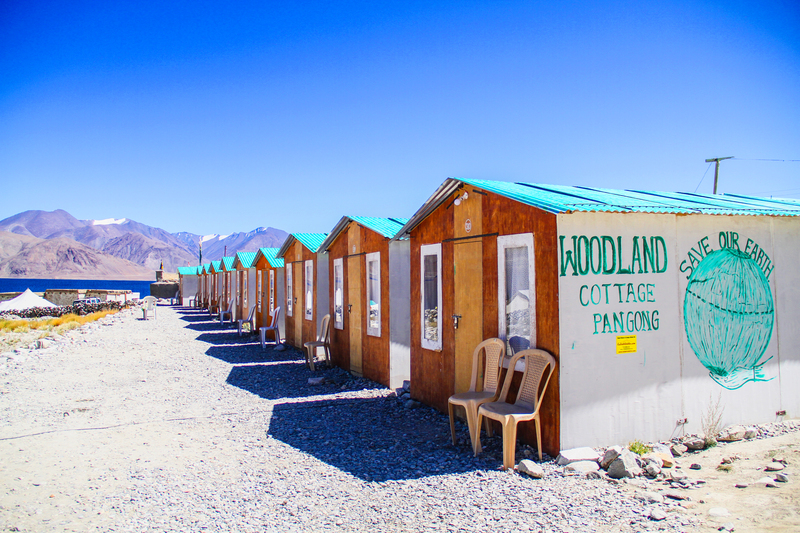 Our 10 double beded Pangong Woodland Cottages has all the basic amenities for comfortable Pangong accommodation. You can easily reach within 5 to 10 minutes to this Breathtaking Pangong Lake from our Woodland Cottages. The Woodland Cottage Pangong has well-furnished dining Hall. Pangong Woodland Cottage offers delicious meals at very reasonable rates for guest. Our well trained staff is very friendly and caring. 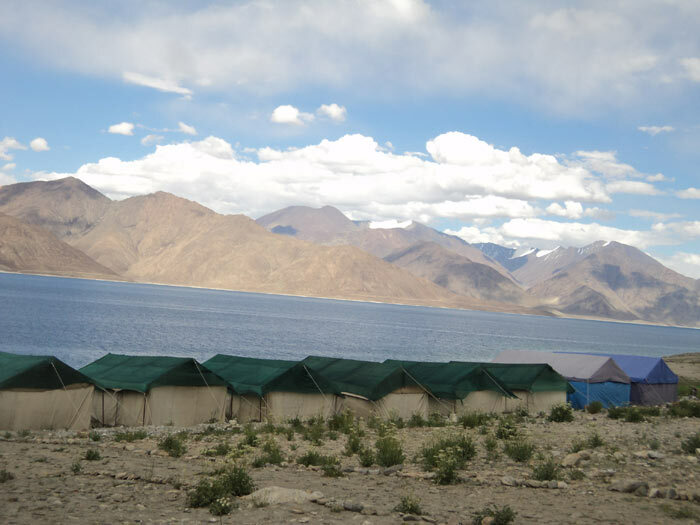 If you are bored of the daily humdrum of your life and longs for a refreshing and rejuvenating place Pangong Lake View camp is the perfect destination. It is a major eco-resort (started in 2008 by Mr. Stanzin Takpa -a local ladakhi, well experienced in tourism) and is located in Spangmik region of Changthang valley. The site faces the beautiful color-changing Pangong Lake (a famous destination in Ladakh). Pangong tso (lake) is an exquisite deep blue lake in the Himalayas, located on the Changthang plateau at a height of about 4,350m(14,270ft). It is at about 150 km away from Leh and is 134 km (83 miles) long and 5km (3.1 miles) at its broadest point and stretches from India to Tibet. The lake is a dead salt lake which supports no vegetation and aquatic life. During winter the lake freezes completely, despite of being saline. One can visit the lake during tourist season - May to September. 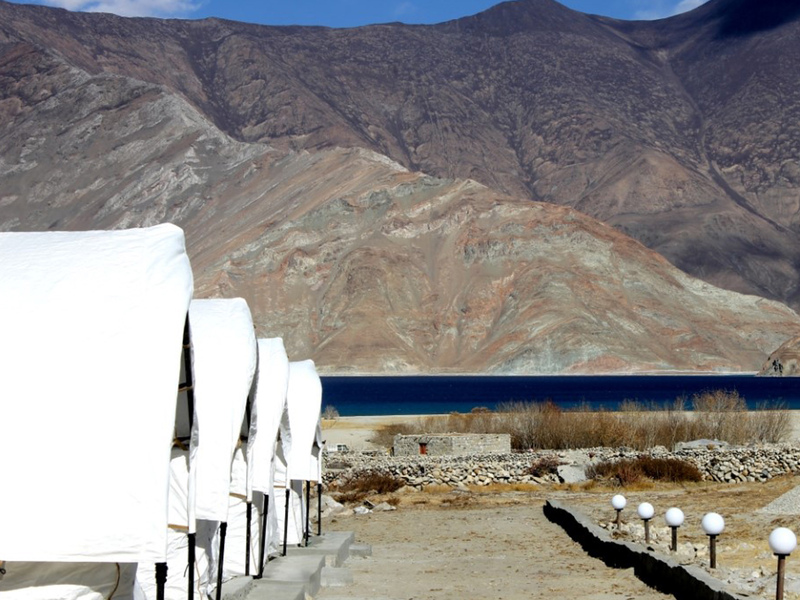 The Monalisa Camp Pangong is a perfect excursion getaway in the peaceful environs of Pangong Tso in Leh Ladakh. It is situated on the main Spangmik Village, on the Pangong Tso, 150 km from the Leh - Ladakh, in a very friendly environment. 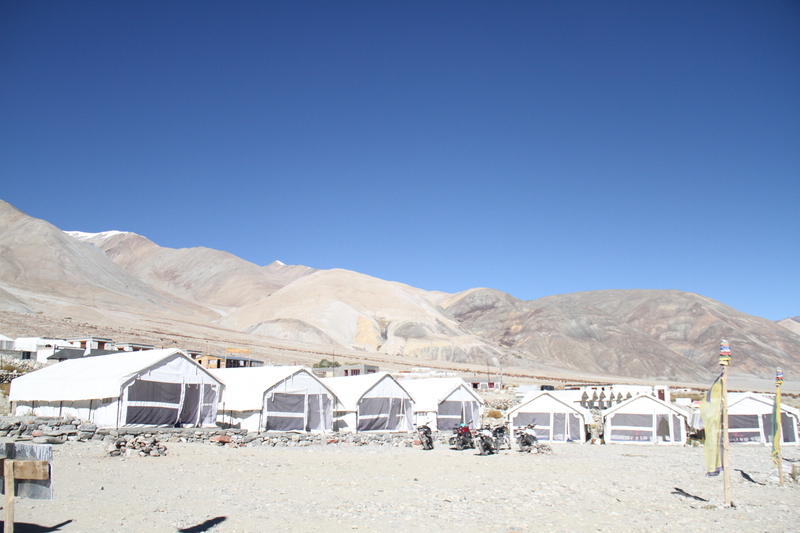 Monalisa Camp Ladakh has 10 Deluxe Camp with attached bathroom. Welcome to Buddha Pangong Retreat Camp – a boutique retreat set facing the magnificent Pangong Lake in Spangmik Village, with stunning panoramic views of nature's gifted scenery. The Retreat offers you a comfortable accommodation providing you with basic amenities allowing you to enjoy a truly unique experience with nature - the golden grass, the sunsets, the mountains and the Pangong Lake, - it's truly a paradise! 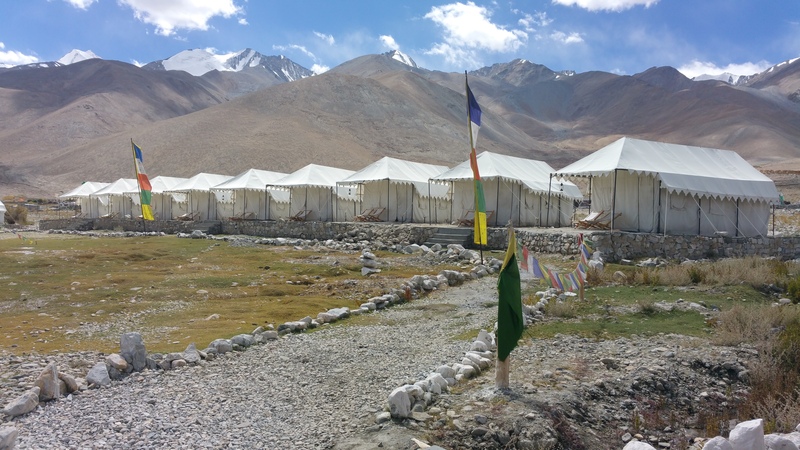 Royal Camp Ladakh is set amongst quite and peaceful surroundings in Spangmik village at an altitude of 4200mtrs above the sea level and 152 km from Leh. The great Himalayas best and impressive of this lake is Pangong Tso. Royal Camp Pangong India is most expensive natural beauty, fresh environment, amazing landscape, the simple hospitality of its people. 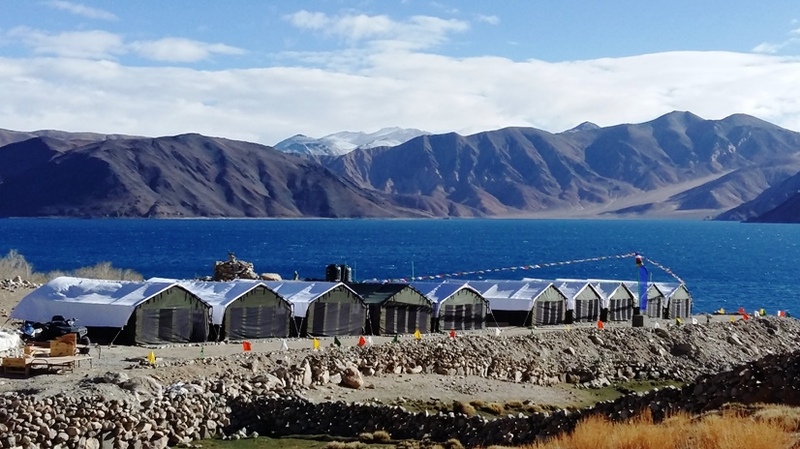 The Kora Pangong Camp comprises of tents with attached baths.Camp is a heaven located on Spangmik Leh Ladakh. We have captured the romance of tents which have always been an important part of lifestyle. 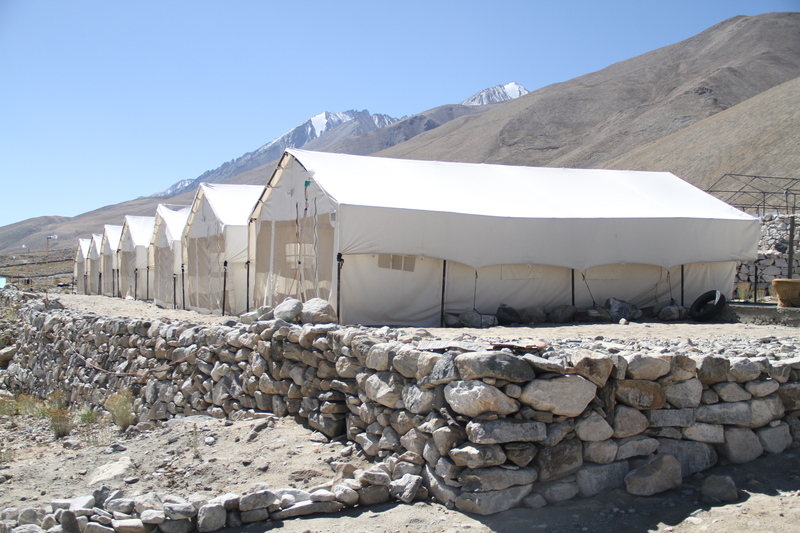 Camp is heaven far from the crowd and surrounded by Pangong Tso and icy mountains in a very peaceful environment. Camp offers a unique experience of cozy camp where the traditional & coloured tents are luxuriously furnished with every comfort.Local cuisine is partly inherited from Ladakhi kitchens (bread, Thukpas-a mild noodle soup, Momos - stuffed dumplings, Thenthuk - another noodle soup etc. ), and partly adapted to what is produced locally.vegetable-barley stew is a local favourite. Brimming with nature’s beauty and elegance, away from the hustle bustle of the city, in the lap of nature, Pangong Tso Eco Resort, is a pristine land parcel at an enviable location- village Merak. The village is situated on the banks of Pangong Tso, at height of about 14,270 and about five hours drive away from Leh. This prime property commands panoramic view of majestic landscapes and water body. The most spectacular edifice of this resort falls in having elements of exclusiveness, which provides an extraordinary and unparallel vacation experience. This iconic address is an excellent tourist destination, for it is one of the last village where Indian or foreign tourist can visit. It is here, if one is lucky sighting of PLA(Chinese) soldiers may happen because of its proximity to LAC(Line of Actual Control). The Rezang La Memorial (Ahir Dham)Ladakh, which is the epitome of sacrifice of over 100 warriors who fought on frozen frontiers against Chinese aggression in 1962, is just an hour drive from the resort. Explore finer things in life with this premium resort! Ser Bhum Tso Resort Pangong A Class Hotels in Pangong Hotel situated in Sangmik, Pangong Lake. Pangong Ser Bhum Tso Resort is enclosed by the scenic charm with snow covered on mountains tops. The Ser Bhum Tso Resort Pangong Hotel presents the guests with well-appointed, appropriate and adventurous experience. 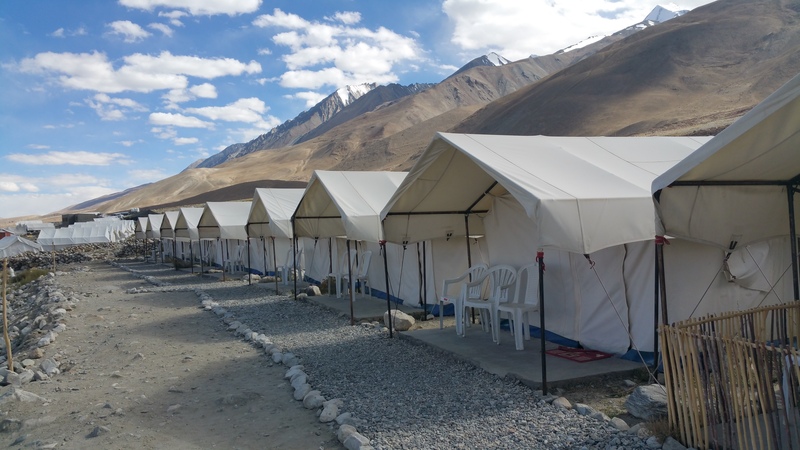 At Camp Watermark Pangong Lake also provided up to date medical amenities for those who may be affected by High Altitude sickness besides first aid services & Oxygen Cylinders. And camp's staff is knowledgeable in providing these amenities. Camp Water Mark also provides electricity in all private bathrooms. 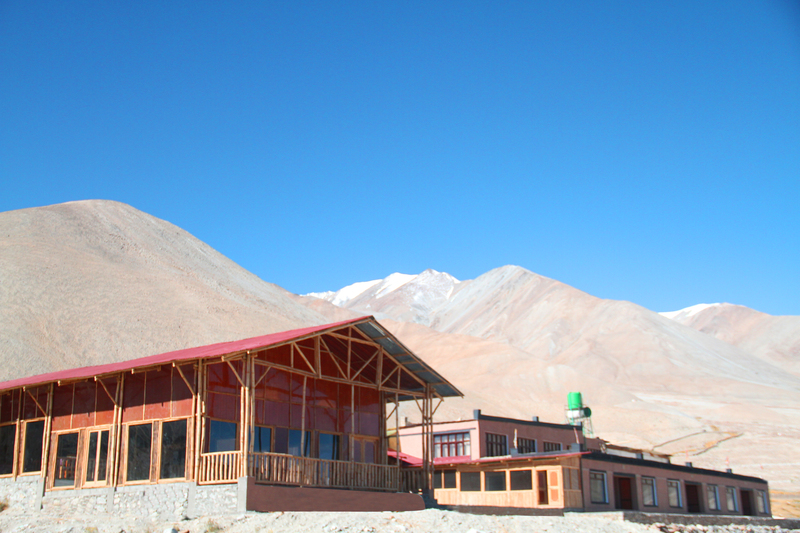 Alpine Huts Pangong is A class Huts in Pangong the only best accommodation near the Pangong Lake, Ladakh. The Alpine Cottage Pangong having 6 luxury cottages with clean attached bathroom. The Cottages are made up of wooden and the woods are imported by other country. Alpine Cottage Pangong is exactly in front of the place where three idiots was shot. The Changla Alpine Cottage Pangong are gorgeously made with a sitting room, dining area and bedroom with windows opening towards Pangong lake. 04 Nights Accommodation in Leh & 01 Night Accommodation in Alchi, Nubra & Pangong Each on twin sharing Basis as per the Itinerary & Meal. The above rates are applicable strictly for NRI and resident Indian citizens only. 100 payment to be deposited before the trip starts. Final tour Vouchers will be provided on receipt of full 100 payment. There would be no refund for the road blocks at Nubra Valley Pangong Lake & Tsomoriri Lake due to natural calamity. The alternate accommodation Cost at Leh due to the same should be bear by the passenger directly. 25 advance (Non Refundable) to be deposited at the time of booking confirmation & Balance 75 one month prior to arrival. Child below 5 Yrs of age will be complimentary without extra Bed..
Hotel Accommodation in Delhi Chandigarh Manali Keylong Jammu Srinagar can be arranged on best deals. 15 cancellation charges if cancelled before 30 days before the tour. 25 cancellation charges if cancelled within a 20 days before the tour. 50 cancellation charges if cancelled within a 10 days before the tour. No Show 100 of tour cost. "Adventure Family Hill Station Culture Offbeat Leisure"